The word "jaggery" comes from Portuguese, ultimately from the Sanskrit शर्करा (śarkarā), the root of the word "sugar" itself. Jaggery is made of the products of sugarcane and the toddy palm tree. The sugar made from the sap of the date palm is more prized and less commonly available outside of the regions where it is made. The toddy palm is tapped for producing jaggery in India, Bangladesh, Pakistan, Nepal, and Sri Lanka. In Sri Lanka, syrup extracts from kithul (Caryota urens) trees are widely used for jaggery production. This is considered the best jaggery available on the local market and is more highly valued than that from other sources. All types of the sugar come in blocks or pastes of solidified concentrated sugar syrup heated to 200 °C (392 °F). Traditionally, the syrup is made by boiling raw sugarcane juice or palm sap in large, shallow, round-bottomed vessels. Cutting sugarcane in a field in India. Historically, the sugarcane cultivators used crushers that were powered by oxen, but all modern crushers are power-driven. These crushers are placed in fields near the sugarcane plants. The cut and cleaned sugarcane is crushed and the extracted cane juice is collected in a large vessel. A certain quantity of the juice is transferred to a smaller vessel for heating on a furnace. The vessel is heated for about an hour. Dried wood pulp from the crushed sugarcane is traditionally used as fuel for the furnace. While boiling the juice, lime is added to it so that all the wood particles rise to the top of the juice in a froth, which is skimmed off. Finally, the juice is thickened. The resulting thick liquid is about one-third of the original volume. This hot liquid is golden. It is stirred continuously and lifted with a spatula to observe whether it forms a thread or drips while falling. If it forms many threads, it has completely thickened. It is poured into a shallow flat-bottomed pan to cool and solidify. The pan is extremely large to allow only a thin coat of this hot liquid to form at its bottom, so as to increase the surface area for quick evaporation and cooling. After cooling, the jaggery becomes a soft solid that is molded into the desired shape. The quality of jaggery is judged by its colour; brown means it is higher in impurities and golden-yellow implies it is relatively pure. Due to this grading scale, coloured adulterants are sometimes added to jaggery to simulate the golden hue. Jaggery is used as an ingredient in sweet and savoury dishes in the cuisines of India, Pakistan, Bangladesh, Nepal, Sri Lanka, Afghanistan and Iran. For example, a pinch of it is sometimes added to sambar, rasam, and other staples. Jaggery is added to lentil soups (dāl) to add sweetness to balance the spicy, salty, and sour components, particularly in Gujarati cuisine. Maharashtra in India is the largest producer and consumer of jaggery (gud (गुड़) in Hindi, "gul" (गुळ) in Marathi, "gur" (گڑھ) in Urdu, and Bella (ಬೆಲ್ಲ) in Kannada). Kolhapur is one of the largest producers of jaggery in India and has a GI Tag for Jaggery. Most vegetable dishes, curries, and dals, and many desserts contain it. Jaggery is especially used during Makar Sankranti for making a dessert called tilgul. In Gujarat, jaggery is known as gôḷ (ગોળ); during Makara Sankranti, a similar preparation called tal na ladu or tal sankli is made. In rural Maharashtra and Karnataka, water and a piece of jaggery are given to a person arriving home from working under a hot sun. Molasses (काकवी), a byproduct of the production of jaggery, is used in rural Maharashtra and Karnataka as a sweetener. It contains many minerals not found in ordinary sugar and is considered beneficial to health in traditional Ayurvedic medicine. It is an ingredient of many sweet delicacies, such as gur ke chawal / chol ("jaggery rice"), a traditional Rajasthani or Punjabi dish. In Gujarat, laddus are made from wheat flour and jaggery. A well-known Maharashtrian recipe, puran poli, uses it as a sweetener apart from sugar. Jaggery is considered an easily available sweet which is shared on any good occasion. In engagement ceremonies, small particles of it are mixed with coriander seeds (ધાણા). Hence, in many Gujarati communities, engagement is commonly known as gol-dhana (ગોળ-ધાણા), literally "jaggery and coriander seeds". In Sri Lanka, jaggery is made using the treacle of the kithul tree. Jaggery is used extensively in South India to balance the pungency of spicy foods. In Andhra Pradesh, it is used for sweets like chakkara pongal, milk pongal (prepared with rice, milk, jaggery). During Sankranti they prepare 'Arisalu' which is an authentic Andhra Pradesh dish. In Kerala, it is considered auspicious and is widely used in cooking. It is a vital ingredient in many varieties of payasam, a sweet dish. In Tamil Nadu, jaggery used exclusively as the sweetener. It is used in a dish called chakkarai pongal. It is prepared during the festival of Pongal (Thai Pongal), which is held when the harvesting season begins. It is used to make kalhi, to sweeten fruit salads and payasam (sweet milk) that are offered to the Gods. Jaggery is used in religious rituals. In rural areas, cane jaggery and palm jaggery are used to sweeten beverages, whereas refined sugar has replaced it in urban areas. In Odia cuisine, cakes or piṭhas contain jaggery. Pithas like Arisa pitha are made out of jaggery called as guda in Odia. Kakara pitha contains coconut filings which are caramelized using jaggery. Guda is also added to rice flakes called as chuda and eaten as breakfast. Some marmalade made of mango and dillenia contain the ingredient. In Bengali Hindu cuisine, it is commonly used in making sweet dishes, some of which mix jaggery with milk and coconut. Popular sweet dishes such as laḍḍu/laṛu or paṭishapta piṭha mix it with coconut shreds. Jaggery is molded into novel shapes as a type of candy. The same preparation of sweets have been made in its neighbouring state of Assam. Some of the popular sweet dishes of Assam such as til-pitha (made of rice powder, sesame and jaggery), other rice-based pitha, and payas are made of jaggery. In some villages of Assam, people drink salty red tea with a cube of gurd (jaggery), which is popularly called cheleka-chah (licking tea). Traditional Karnataka sweets, such as paayasa, obbattu (holige) and unday use different kinds of jaggery. A pinch is commonly added to sambar (a.k.a. huLi saaru) and rasam (a.k.a. saaru). Karnataka produces sugar- and palm-based jaggery. The combination of crushed jaggery with ghee is excellent and goes well with chapathi. The Muzaffarnagar District in Uttar Pradesh has the largest jaggery market in the world, followed by Anakapalli in the Visakhapatnam District in Andhra Pradesh. The Kolhapur District in western Maharashtra is famous for its jaggery, which is yellow and much sought-after in Maharashtra and Gujarat. Mandya in Karnataka is known for its jaggery production. In Myanmar, jaggery is harvested from toddy palm syrup. In central Myanmar and around Bagan (Pagan), toddy syrup is collected solely for making jaggery. The translucent white syrup is boiled until it becomes golden brown and then made into bite-size pieces. It is considered a sweet and is eaten by children and adults alike, usually in the afternoon with a pot of green tea. It has been referred to locally as Burmese chocolate. 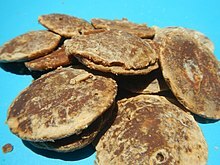 Toddy palm jaggery is sometimes mixed with coconut shreds, jujube puree or sesame, depending on the area. This type of jaggery is used in Burmese cooking, usually to add colour and enrich the food. Other uses include jaggery toffees and jaggery cake made with pumpkin preserve, cashew nuts, peanuts and spices. Jaggery may be used in the creation of alcoholic beverages such as palm wine. Besides being a food, jaggery may be used (mixed in an emulsion with buttermilk and mustard oil) to season the inside of tandoor ovens. Jaggery is used in natural dying of fabric. It is also used in hookahs in rural areas of Pakistan and India. 'Sharkkara'(ശർക്കര) or 'Chakkara'(ചക്കര) or 'Vellam' (വെല്ലം) in Malayalam(Language), 'Karuppaṭṭi' or 'Karippaṭṭi' or 'Karipetti' (കരിപെട്ടി) is jaggery made from palm juice, and 'Panam Kalkandam' (പനം കല്കണ്ടം) is rock candy made from palm juice. Bella in Tulu: Vale bella is a type of jaggery which prepared from toddy. Gula apong in Sarawak, Malaysia is a variant of the jaggery, which is made from the sap of the nipah palm or Nypa fruticans. Jaggery (gur) making at small scale near sugarcane farm in Pakistan. 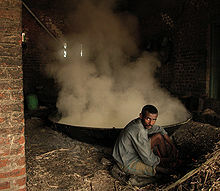 Boiling the sugarcane juice in large-scale jaggery (gur) making in India. Transferring boiled sugarcane juice into vessel to dry. Gud or jaggery: Sugarcane-derived raw sugar crystallised cubes or blocks. Gur mamra laddu sweets made from jaggery and puffed rice. ^ "New improvements in jaggery manufacturing process and new product type of jaggery". Panela Monitor. Retrieved 2014-08-30. ^ a b c "Media | Practical Action" (PDF). Itdg.org. Retrieved 2011-09-28. ^ "Jaggery". Oxford. Retrieved 2017-07-24. ^ "Kolhapur: Second Largest market of gur" (PDF). IRJET. Retrieved 2018-05-14. ^ "Jaggery and Confectionery". APEDA, Ministry of Commerce & Industry, Government of India. Retrieved 2009-06-19. ^ Kalra, J.I.S. ; Das Gupta, P. (1986). Prashad Cooking with Indian Masters. Allied Publishers Private, Limited. p. 10. ISBN 9788170230069. Retrieved 2015-09-13. ^ "Brown Sugar from Okinawa | Art of Eating". artofeating.com. Archived from the original on 2013-04-22. Retrieved 2015-09-13.